That includes ALL products including On-Sale products! Holsters, targets, books, training, gun accessories, safes, lubricant, patches, rods, brushes, apparel, cases, bags, eyeware, hearing protection, gunsmithing tools, reloading gear, etc. No complicated coupon codes to remember! As soon as your membership is active you will see the “Member discount” notification on all the products in the store and the 10% discount will be automatically applied. Get started now and start saving! 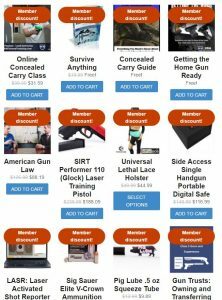 PLUS: Members also receive 15% off membership fees with the USCCA and 5% off purchases on AmmoSupplyWarehouse.com!